It's always a little tense when the treaty body members have a session with the states parties. The states elect the treaty body members, ask them to be impartial and independent, and then bristle when those same treaty body members offer criticisms and recommendations for how the state could improve its human rights conditions. The session on Tuesday was no exception. Of the 57 state delegations that attended, 34 have a report being reviewed by one or more of the 9 human rights treaty bodies during 2009. In addition, 38 of the 57 countries have experts elected to one or more treaty bodies from their own country. In fact only 10 of the state delegations who attended the Tuesday session had neither -- no report coming up before a committee in 2009 and no expert on any committee. Several states commented on the burden of preparing state reports, the conflicting requirements and practices from the different treaty bodies, and the difficulties to prepare for a presentation to a treaty body when each treaty body was very different in its procedures and expectations. There has been an effort in recent years by the treaty bodies to harmonize their practices so that the look and feel of each treaty body experience is more consistent. But several states and treaty body members acknowledged that this harmonization effort needs to continue. 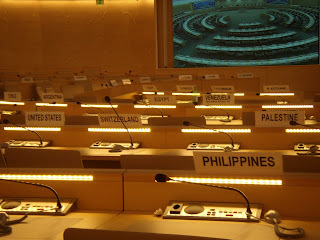 Several states were particularly critical of the treaty bodies willingness to hear testimony and consider documentation from NGOs, particularly when this information was contrary to the state's own testimony and documentation. This is a common criticism heard each year and of course is more prevalent among states who have serious human rights problems. Several states were also critical of the practice by some treaty bodies to review state conditions in countries who have failed to file a report. This "in absentia" review was viewed as unfair and unsuitable. This issue is another that comes up each year. The problem faced by the treaty bodies is that they are tasked with reviewing state compliance to the treaty, but some states have never filed a report from which such a review can be made. Other states have failed to file reports for many years. On average, reports are due every 4 or 5 years, but some states haven't filed a report with the treaty body for over 30 years. Some treaty bodies have now adopted a practice of reminding states by letter if they haven't filed for over 10 years, and then stepping up the pressure with further reminders, personal visits, and other efforts to escalate the communications, to try to incentivize the state to file its report. Finally, if all efforts to get the country to respond have failed, the committee then schedules the country for review in the absence of a report. It is this final step that several state delegations were critical of in the Tuesday session. There was also a spirited debate and clash of viewpoints between the delegation of Egypt and the Committee Against Torture (CAT), regarding the recent review of the compliance report of Israel before CAT. The representative from the Egyptian delegation was especially critical of the committee's final conclusions and observations, feeling that the committee had taken too many statements of the Israeli delegation at face value and had failed to challenge them. Both the Egyptian delegation and members of the CAT were quoting from the final CAT report to make their points. Some of the other comments and suggestions from states were better time management of sessions, better advance notice of issues and topics to be discussed in the state review session, better transparency of information that the committee is relying upon, and more efforts to remove backlogs and speed up proceedings. All in all, it is remarkable to realize that the system works at all. States have essentially given up a little bit of their sovereignty by ratifying human rights treaties which authorize the committee established under the treaty to poke around into their domestic affairs and criticize their practices. Yet after nearly 40 years of human rights treaties in operation, we are approaching universal ratification of the human rights treaties by all of the countries in the world. All countries in the world have ratified at least 1 of the 9 human rights treaties. Some treaties, such as the Convention on the Rights of the Child and the Convention on the Elimination of all forms of Discrimination against Women, are nearing 100% ratification.